The fact that Guillermo del Toro’s latest offering is a carnival of visual ebullience probably won’t come as a shock to anybody out there. 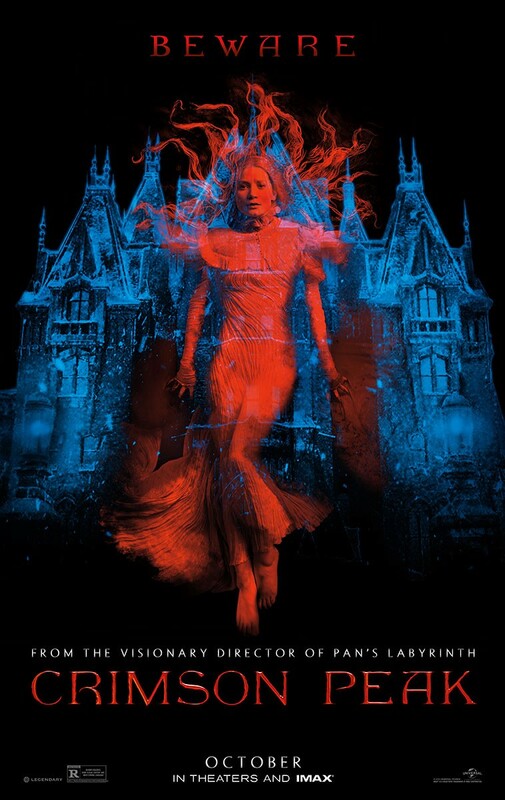 A 19th century Gothic nightmare with lots of frothy verbiage, every last word enunciated to the nth degree, Crimson Peak delivers in most of the areas we would expect but not all of the areas we would like. Granted, this is not a horror movie nor does it try to be anything of the sort, but its fleeting moments of fright never quite amount to the haunted atmosphere del Toro covets. The narrative also takes some time to explode into life, eventually doing so with menace. At least until then we have a bedazzling aesthetic to keep us company. Mia Wasikowska plays Edith Cushing, a young woman who seeks to carve her own way in the world without relying on her father’s (Jim Beaver) wealth. She writes (stories with ghosts, not ghost stories), though Edith’s professional hopes are initially dashed under the guise of superfluous reasoning when a superior decries her “feminine handwriting” and the lack of romance in her tale. Crafty and stubborn, she swaps pen strokes for typing but remains steadfast on narrative content. Matthew Robbins co-wrote the film with del Toro and, in Edith, the pair have concocted a female character whose determination to evade tradition is at odds with the prevailing social structure. She meets Thomas Sharpe (Tom Hiddleston) when the latter shows up looking for funds to support his clay processing invention, and the duo fall in love. From dad to would-be muse Dr. Alan McMichael (Charlie Hunnam), everybody is wary of Thomas’ intentions: “There’s something about him that I don’t like”. Everybody except Edith, who really should have taken the hint upon seeing Thomas converse with his mischievous sister Lucille (Jessica Chastain) in the shadow beneath a large, looming tree. 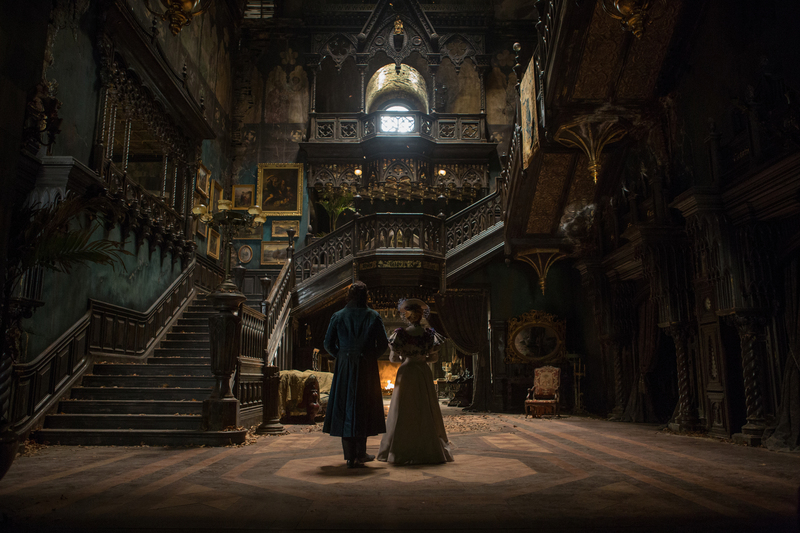 Crimson Peak’s technical prowess is there for all to see, its rich texture and engrossing visuality arguably on a par with del Toro’s masterpiece Pan’s Labyrinth. But it lacks that film’s beating heart, perhaps because it is tougher to empathise with Edith here than it was Ofelia there. Pinpointing exactly why the Edith’s plight doesn’t translate as well is difficult; Wasikowska is perfectly fine in the role and her character is not disagreeably construed. It is true that her words are often quite gushy, certainly more so than those spoken by Lucille, and at best on a par with Thomas’ dialogue. The film isn’t excessively melodramatic but its swirling air of grandiosity can hinder the credibility of characters’ actions — from where, for instance, is Edith’s insurmountable trust in Thomas born? To align grand romantic gestures and sap-filled exchanges with Gothic fiction would be a fair assessment, though I’d argue the genre itself is in that case flawed. Or, at the very least, the aforementioned traits don’t meet the screen with enough grounded authenticity in Crimson Peak, and definitely don’t fit a character who is trying to break free from cultural the norm. Edith’s mother appears in ghost form, an apparition cut from the same ocular cloth as the spectre in another Jessica Chastain outing, Mama. Chastain has more to sink her teeth into here; as Lucille she is very mysterious, her movements icy and her stare searing. She often dawns extravagant gowns but unlike the bright, undiluted garments worn by her sister-in-law, Lucille’s attire often reflects her dark interior (deep rose-coloured and sharply defined). Her undulating poise sets a tone of torment and, as it transpires, Chastain is a terrific passive-aggressive tormentor. But Lucille is also on the verge of mental collapse — her composure, fake, could come unstuck at any moment. Tom Hiddleston is also very good, though his role commands a different shade of mystery. He must be both a schemer and a sympathiser, and the actor finds the correct balance between the two. You feel his conflicted plight, yet you still can’t fully trust his crow-esque demeanour. In a sense the film is crying out for more interactions between the siblings, especially during its less compelling first half. A word too for Burn Gorman who is superbly cast as a sly detective of sorts, slinking around in the much the same vein as Metropolis’ Thin Man. At times del Toro’s film is exceptionally violent. One bathroom-set murder harkens back to Casino Royale’s pre-title brawl, only this one is much blunter and probably much bloodier too. It is part of an effervescent production design that somehow straddles the line between realistic and dreamlike: marvellously crafted sets, eye-catching costumes, piercing sounds (just wait for Lucille’s ceramic-screeching monologue). Enshrouded in a bleak snowy mist, Allerdale Hall — the mansion that hosts proceedings — could pass for a miniature Voldemort-led Hogwarts. Dan Laustsen’s camera swoops around torn halls and through once-noble doorways as if flaunting the Titanic. When it comes to housing, del Toro is decorative master and he incites every moan, groan, and grumble from Allerdale Hall as possible. Blood red clay seeps from floorboards and bleeds down the walls in Evil Dead II fashion; it’s as if the building is literally sinking into hell. Crimson Peak benefits from the process of time, with each passing second coaxing greater momentum and a rise in intrigue level, until the film reaches its barnstormingly gory finale. But it also benefits from boasting a cast who collectively prescribe to the mood of the piece, and a director who knows this genre — his genre — better than most. Adam, excellent review here. Your criticisms are echoed in other reviews, yet you give it high marks. I’m glad you liked it–del Toro creates another visual spectacular. This seems like a slow-burner but if you are patient, the film mellows in you and you come out liking it in the end. That’s the impression I’m getting. That’s exactly how I felt when watching it. In a way I think it’s quite easy to dismiss something like this — an big romantic, period-set fantasy — without truly appreciating its technical achievements. It’s also very well acted too. I do think there’s a bit of a central character issue (in that Edith is half-way between traditional and rebellious), but otherwise del Toro has once again created a really good piece of cinema. Thanks Cindy! Excellent review. Really looking forward to watching it. Much appreciated, hope you enjoy. This is the first very positive review I’ve read on this, which surprises me as Ibexpecte it to get great reviews. Despite everything I’m still very much looking forward to this; I love deal Toro! Excellent review! I have been looking forward to this, although it seems it didn’t get the amazing feedback we were expecting. I will definitely check it out when I come across it though! Yeah, I was sort of swithering between giving it three stars or four stars. It’s probably just about a four star movie, but I did struggle to sympathise with the central character which is a shame. Thanks Zoë! Good read mate, you had me at “a carnival of visual ebullience” and “frothy verbiage”! You liked it more than me but I don’t think I could find anything in your review that I would disagree with.